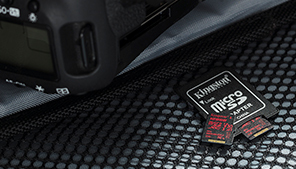 Maximize footage from your drone, GoPro® or Ultra HD camera with Kingston’s Gold microSD UHS-I Speed Class 3 (U3) card. Shoot footage at up to 30 frames per second in 4K and capture 120 frames per second in 1080P HD. Increased write speeds let you shoot in continuous burst mode and higher sustained write speeds ensure video integrity by reducing stutter. Suitable for the most extreme conditions. 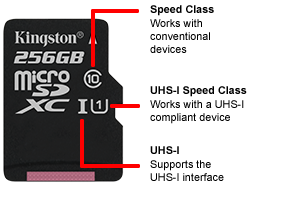 Optional SD card adapter available. 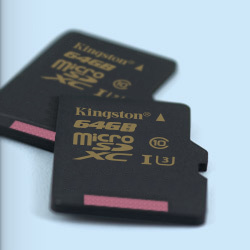 The SD card association defines card speeds using two terms: Speed Class and UHS Speed Class. UHS (Ultra High Speed) uses minimum write speeds to differentiate the cards; UHS-I Speed Class 1 has a minimum write speed of 10MB/s while UHS-I Speed Class 3 has a minimum write speed of 30MB/s. It’s easy to select a card that matches the interface and speed class required by the host device, such as a camera or camcorder. Long buffering – when you press the shutter and the camera takes the shot but then it freezes until the data is fully written to the card. Corrupted video – video cameras might produce corrupted video files if the card speed is too slow or the camera may downgrade the video to match the speed of the card. This could turn full 1080p HD video into a video with much lower resolution. Shortened clips – when a camera has a higher writing speed than the Flash card, the camera will pause and the video clip will abruptly end once the speed limit of the card is reached. Burst shooting – many cameras have a burst mode feature where one press produces a repeated series of photographs; this allows users to capture fast-moving events or subjects like pets and children. If the card writing speed is too slow, burst mode setting will not work.